“A starving artist is an artist who sacrifices material well-being in order to focus on their artwork. They typically live on minimum expenses, either for a lack of business or because all their disposable goes toward art projects. Related terms include starving actor and starving musician.” - Wikipedia. 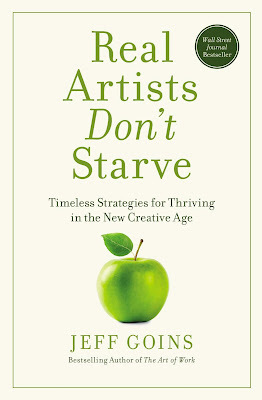 I recently heard about a book called “Real Artists Don’t Starve” by Jeff Goins. I highly suggest you go to your favorite store (brick and mortar if you can find one, or online) and get a copy. While it’s contents and meaning are no surprise to me, it does confirm many things I have been barking about on this blog and to clients for years: Real artists don’t have to be “starving artists” but indeed can thrive...just not the way you maybe think. I’m not finished with the book, but so far three important things have jumped out at me. You need to work with someone better than you. This has been my mantra and what I did before I started any of my businesses. I crawled out of my secret laboratory and started working with engineers, players, and others that possessed abilities I didn’t have. I found mentors and asked them every question I could about what I wanted to do. I still do it. You need to find patrons. These are people who not only like your work, but truly support it. Maybe they get involved financially, or in some other way, but they are true believers and would do anything to help you succeed. They believe in you and your talent, and have for years. This could be a producer, a publisher, a record label, or some other creative, or it could be an uncle, a neighbor, a member of your church, or teacher. They have the ability to connect you because they see the worth and potential of your talents. Here’s a real secret to this patron business that the author points out: sometimes your day job can be your patron. He uses a few examples of artists who used or still use their day job to “pay for them to create in their free time”. When you think of it that way, quitting your job to do music, art, or acting sounds kind of dumb. What if you can compartmentalize your “work”, and FOCUS on your creating? This takes the “work” out of work. Maybe that means using breaks to write fiction, weekends to make albums, early mornings or late nights to paint, or whatever your creative passion is. Your day gig could pay your bills and “pay you” to be a creative. When you think of it that way, suddenly that day job doesn’t seem like so much of a burden to your art does it? You have to go where the scene is. You can stay in your little town as long as you want, and keep doodling and messing about as you always have. But if you want to get to the next level, build true followers of your art, and improve, you eventually must go where the industry is for your art. That could be Hollywood, New York, Austin, Nashville, Orlando, or some other town where people who are at the top of the craft you want to be in are located. There’s no need to be a “starving artist” if you don’t want to. Your parents, friends, and others may have told you not to quit your day job, or urged you to! Either way, the whole idea you have to "suffer" for your art is kind of a old artists wives tale.